From a cryptographic aspect zero-knowledge protocols for graph isomorphisms, graph non-isomorphisms, and graph-coloring are artificial problems, that received lots of attention. 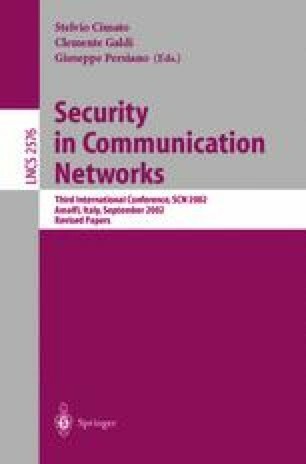 Due to recent work in network security in a broadcast setting, it seems important to design efficient zero-knowledge protocols for the following graph problems: independent set problem, neighbor independent set problem, and disjoint broadcast lines problem. In this paper, we will introduce a new concept of k-independent set problem which is a generalization of independent set and neighbor independent set problems, and we will present efficient zero-knowledge protocols for these problems. In the end of the paper we will give some cryptographic applications of k-independent set. Especially, we will point out the applications to the concept of “threshold” and appropriate access structures. Note that k-independent set also has applications outside cryptography, such as biology, methodology of scientific research, ethics, etc., which are beyond the scope of this paper. This author is partially supported by DARPA F30602-97-1-0205.